History of Pando, Bolivia’s Northernmost State. Bolivian History. ESPAÑOL This is a detailed summary of the history of Pando. You can learn more about Pando Bolivia by looking up information on points that are of special interest to you or by asking questions in our Pando forum. Bolivia’s newest department (state) is located to the extreme North of the country, between the departments of La Paz and Beni to the South, Peru to the West, and Brazil to the North and Northeast. It is completely covered in jungle, is very sparsely populated as its entire population could fit into one neighborhood in a mid-sized city, and it is the third smallest of Bolivia’s 9 departments. Its pre-Colombian history is practically unknown, other than the names of its original indigenous inhabitants. Due to its characteristics, no one civilization prospered more than another in this region and there were only human settlements in wooden and fiber huts along the banks of navigable rivers or in clearings amidst the nearly impenetrable rain forests. These tribes did not know or use hand tools, nor did they use hand-hewn stones for building, as other American peoples did. Due to the simplicity of their lifestyle (they were hunters and gatherers) little is known of their origins and to make matters even more difficult for anthropologists and archeologists, they used mostly biodegradable tools made from natural materials that disappeared; therefore they left no pottery or clothing or headdresses, nothing which could be used to date their origins. Thus, very little is known of the aborigines of this area other than what their myths and legends tell us and the fact that a handful of tribes, some near extinction today, still exist: the Pacahuaras, Esse Ejja, Yaminahuas, Tacanas, Caripunas, Cavineños, Machineris, and Toromonas. When the Spanish arrived in this area in the 16th Century, they were careful not to enter the Amazon jungles too deeply despite the draw of the legendary city of El Dorado, which was said to have been a city made entirely of gold and precious gems buried in the depths of the Amazon. One can only imagine the infernal trip through the jungle, opening a path with a machete, only to have the jungle close again behind you; the fierce carnivores, miniscule toxic insects, and huge serpents that are said to swallow a man whole; or not knowing if the flower you just touched is poisonous, if the soil you are treading on is in reality a deep swamp where with one false step you can sink to your death; or hiking the jungle without a compass, the lack of light as you pass through a jungle so thick the sun cannot pass through the trees; or being obligated to eat wild fruit and drink water of suspicious origin that could end in poisoning or dysentery; not to mention the insufferable heat and humidity … no conquistadors dared to emulate Captain Francisco de Orellana, who discovered the Amazon, as they did not wish to end up swallowed by the jungle as he was. Thus, other than a few towns founded by brave Jesuit priests a century after the Conquest in the neighboring Moxos region, there were no expeditions to the Amazon during the first two centuries of the Colonial period. By the end of the 18th Century the Portuguese had colonized Brazil and greedily hungered for the riches found in the Spanish colonies. They sent groups of explorers to the border regions of Moxos and Chiquitos, which at the time were governed by the Audiencia of Charcas, abducted and enslaved the native peoples they found, and settled in Spanish territory, claiming it as their own. Sometimes they assaulted indigenous reservations maintained by the Jesuits or border garrisons belonging to the Spanish. In order to bring a halt to these incursions, the Spanish Crown sought to clearly delimit the border with Brazil and signed three treaties with Portugal: the first in 1750 (the Treaty of Madrid), the second in 1777 (the Treaty of San Ildefonso, which resulted in the expulsion of the Jesuits from the region), and the third in 1801 (the Treaty of Badajoz). These treaties defined the territory of the Colony known as Acre (named after the Aquiry River) which was placed under the governance of the Audiencia of Charcas. 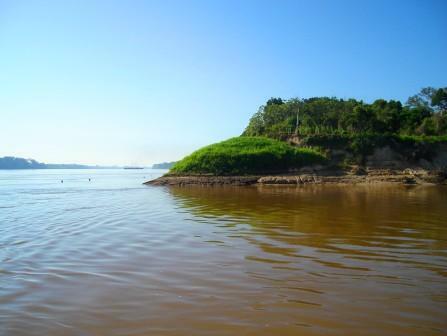 Brazil was to respect the defined borderlines established along the Yavari River and down to the mouth of the Madera River. The clarity of these borderlines was blurred in 1776 when the Audiencia of Charcas was transferred to the Rio de la Plata Viceroyalty and resulted in a disagreement, for this reason, with the Viceroyalty of Peru. This dispute was eventually inherited by Peru and Bolivia when they became independent republics. While the rest of the Colony was busy fighting the Wars for Independence from Spain, nothing at all was happening in Acre. When Bolivia became an independent republic in 1825, still nothing happened here. However, after the Peru-Bolivia Confederation fell apart, both countries began to dispute their sovereignty over the 355,242 square kilometers of territory that was Acre. Meanwhile, in 1839 Brazil took advantage of the situation to allow its citizens to violate the borders that had been defined and re-mapped the region, annexing a large part of Bolivia’s territory and a small part of Peru’s. By the time Bolivia and Peru had come to an agreement that the territory belonged to Bolivia, the damage had already been done: Brazil had annexed Acre. In 1867, a mentally unstable de facto president, Mariano Melgarejo, who gave a portion of Bolivia’s territory to Chile in a fit of vanity, once again demonstrated his mental fragility when he official gave the territory of Acre to Brazil, by delivering to the neighboring country the paperwork that made their annexation of this region official and legal. But not all was lost in Acre. Bolivia still owned over 253,000 square kilometers of territory, which was subdivided into three poorly delimited regions. As of 1877, Brazilians began to populate the area. They exploited the siringa forests (rubber trees which had been discovered by Antonio Vaca Diez of the department of Beni in 1876) and the gold nuggets that washed through the river basins. As there was almost no population of Bolivian origin in this region, the population answered to the government of Brazil, thus becoming a foreign colony within Bolivia’s borders. In order to solve this problem, an International Border Demarcation Commission was formed in 1898. It ended up siding with Brazil and Bolivia lost more territory. The country had no other entities to appeal to and the Federal (civil) War had just begun. Bolivia was in chaos and the army was weak and unable to help exert Bolivia’s rights over the annexed territory. Once the civil war had ended, a group of pioneers was sent to Puerto Alonso (which is Porto Acre, Brazil today) in 1899. A police garrison and customs station was set up. This customs office imposed taxes upon rubber exported, all of which was owned by Brazilians, and this set off the Acre War. It all began when the governor of the State of Amazonas, on the Brazilian side of the territory of Acre, became enraged over the new rubber tax. He declared that Bolivian customs officials in Puerto Alonso had been committing imaginary crimes and promoted a secessionist movement led by a Spaniard who answered to him. The Spaniard, Luis Gálvez Rodríguez de Arias, attacked Puerto Alonso, expelled the authorities, and declared himself President of the Nation of Acre. Bolivia responded by sending in three expeditions from La Paz and Cochabamba led by Muñoz, Pérez Velasco and Montes, three rival politicians who were forced to unify to defend the Acre region. The most important battles of this war took place in Riosinho, Capueiro and Bague, and were won by Bolivia. With the separatist defeated, tranquility returned to the region, and the Brazilians took the self-proclaimed “president” Gálvez prisoner due to his defeat. A few years later, now under the governance of José Manuel Pando, the decision was made not to send troops to colonize the region and thus make a show of presence, which would have been the sensible thing to do. Instead, a transnational rubber company was set up between Bolivia and the U.S. called The Bolivian Syndicate, and rubber taxes were increased. Brazil protested this and once again promoted a secessionist movement, this time among the siringueros (rubber tappers), led by Brazilian José Plácido de Castro who declared Acre an independent state in 1902 at a time when Bolivia was busy celebrating its national independence day on August 6th. His troops attacked Puerto Alonso and the Barraca de Bahía (which is the city of Cobija today), where Bolivian siringueros worked. The Bolivian government sent no help; therefore, Nicolás Suárez, a rubber magnate from the neighboring state of Beni, paid out of his own pocket to form Bolivian defense guerrillas which he called the Columna Porvenir. They were commanded by a career military man named Federico Román, and won the battles of Bahía and Costa Rica. However, another portion of the Bolivian regular army, commanded by Rosendo Rojas, did not do well. The lost at a point called Vuelta de la Empresa, and later lost again at Puerto Alonso. Upon hearing of these defeats General Pando decided to travel to Acre in person, and took reinforcement troops with him. This alarmed Brazil, which decided to send its own army to support the rebels. After a painful months-long march from La Paz to Riberalta (in Beni), General Pando met up with the Columna Porvenir troops and together they entered into the battle of Puerto Rico against Brazilian general Olimpio de Silveira and the rebel siringueros (rubber tappers). The Bolivians won this battle but the country was not willing to enter into another war; thus, after a long debate, Congress decided to opt for an armistice and a diplomatic solution. Thus, on 21 March 1903 Bolivia signed a provisional Modus Vivendi treaty acknowledging the status quo previous to the conflicts, which allowed the rubber tappers and gold miners to continue working in the area, and Bolivian troops were withdrawn. On 17 November 1904 Brazil and Bolivia signed the Treaty of Petropolis by which Bolivia ceded the last 191,000 square kilometers of Acre that it owned to Brazil, and kept just 10% of the original surface of this territory for itself. Bolivia was compensated for this territorial loss: the country was given a piece of land near the Paraguay River (in the southeastern Chaco region of the country), three border town customs agencies in Brazilian cities, and the construction of the Madeira-Mamoré railroad from Porto Velho in Brazil to the city of Riberalta, in Beni for rubber exports. Brazil also paid Bolivia 2 million sterling pounds as additional compensation. No one knows what the government in La Paz did with this enormous sum of money which, today, would be worth about 300 million dollars because Pando never saw one cent. Ambitious Brazil, not content with its new acquisitions, also fought against Peru between 1902 and 1904 to annex Peru’s portion of Acre, but that is another story. It was the charismatic lieutenant coronel Germán Busch, of Santa Cruz, a hero of the Chaco War and the youngest president in Bolivia’s history, along with Mariscal Sucre, who finally shaped the department of Pando. In 1938, during a national legislative convention, Busch passed the 24 de Septiembre law, ordering the creation of the Department of Pando, as a separate state from Beni. He named the new state in honor of General Pando and Barraca de Bahía was made the new state capital, although its name was changed to Cobija in remembrance of the Port of Cobija, a port lost during the War of the Pacific against Chile. The new department (state) was divided into four provinces; Abuná, Madre de Dios, Tahuamanu, and Manuripi, along the main rivers. Half a century later a fifth province was added called Federico Román, and one of the other four provinces was re-named Nicolás Suárez, in homage to the heroes of the Acre War. The department has a surface area of 63,827 square kilometers, just a fraction of its original size. Pando, which along with Beni, had been the center of rubber exports since 1920, ceased to be so soon after its creation. Natural rubber, which has been amply required for the automotive industry and was sold at very high prices, had become the second largest Bolivian export after tin, and made many men, such as the aforementioned Nicolás Suárez, very wealthy. However, when World War II began, the price of rubber fell steeply because it was very complicated to import rubber from Bolivia and Brazil. It had to be transported across the Atlantic which was now infested with German submarines that enjoyed sinking ships. The U.S. then began producing synthetic rubber from petroleum derivates, still in use today, and the prosperity of this Amazonian region declined greatly, along with its population. Over the years the department became impoverished, and still is today. Currently, the department of Pando’s main sources of income are exclusively from timber, gold mining and other minerals, some rubber extraction, and Brazil nuts. Other economic activities, such as agriculture and cattle ranching, are done mostly at the subsistence level. In addition, since Pando is not located along the habitual tourism routes, it does not perceive much income from this either, other than some income from ecotourism. It has very little tourist infrastructure as it continues to be a thick jungle riddled with rivers, has very few roads, and suffers from continuous flooding. Therefore the department continues to be practically ignored at the national level, and rarely makes headlines except when truly unfortunate events take place such as the armed confrontations that took place on September 11, 2008 in Porvenir over issues involving land, politics and intolerance, although some positive reforms to the administrative and political structure have been implemented in the country over the past few years.